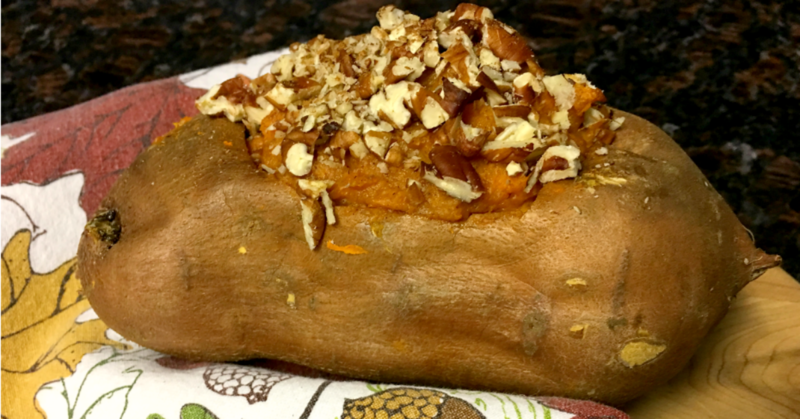 This Twice Baked Sweet Potato recipe is a unique, single-serving twist on sweet potato casserole. It is perfect for a Thanksgiving or holiday meal or for those times when you want to jazz up your plate during the week. This Thanksgiving will be the first time I'm hosting out of town family. Of course, the images of a Norman-Rockwell-style holiday are dancing through my head, but I'm also trying to be realistic about my expectations. The fact that we'll have 3 little ones under the age of 4 years old in our company means anything can happen. In my opinion, there are just some things that need to be on the table for Thanksgiving. After the turkey; mash potatoes, pumpkin pie, canned cranberries, and green bean casserole are must-haves. Not to be forgotten, are the sweet potatoes. The delicious sweetness intensified with brown sugar, cinnamon, and copious amounts of butter make my mouth water just thinking about them. But sweet potatoes seem to be polarizing - people love them or hate them. You obviously know where I stand, but my husband would be fine if he never laid eyes on them for the rest of his life. 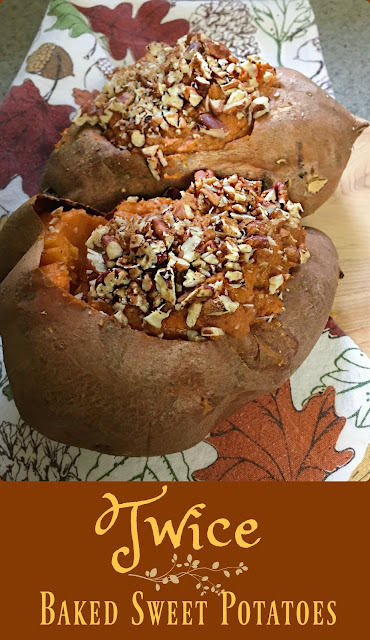 To make sure everyone gets what they want this year I'm going to be making a modified version of Sweet Potato Casserole with this Twice Baked Sweet Potato recipe. Scrub the outsides of the potatoes thoroughly. Preheat the oven to 400 degrees and bake for 55 minutes, or until potatoes are fork tender. Change oven to 350 degrees. Let potatoes cool for five minutes. Cut an oval shape out of the top of each potato and peel back the skin. Carefully scope out potato filling, leaving plenty of room along the edges to ensure you do not accidentally pierce the outer edges. Put the potato filling in a large bowl and with a mixer combine it with the butter, whole milk, cinnamon, and brown sugar. Once the mixture is whipped and well incorporated, scoop it into each of the potatoes. Sprinkle with the chopped pecans and put back into the oven for 20 minutes to continue cooking. Remove and allow them to cool for 5-10 minutes before serving. Do you love or hate sweet potatoes? What are some Thanksgiving must-haves that you are looking forward to this year? If you're hosting guests this year, don't stress about the turkey. Try this super simple crockpot turkey recipe.